Concord, NC (July 6, 2016) – Dalton Sargeant will look for his first ARCA Racing Series presented by Menards victory this weekend in the ARCA 150 presented by Casey’s General Store at Iowa Speedway on Saturday, July 9. Sargeant, locked in a tight battle for ARCA Rookie of the Year honors with fellow competitor Chase Briscoe, has earned seven consecutive top-10 finishes in as many races. 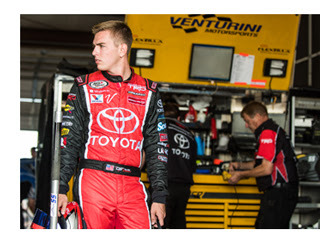 Driving Venturini Motorsports’ No.55 Toyota Racing Development – Windows 10 Camry during 15 of the 20 series events, Sargeant has already scored two runner-up and five top-5 finishes thus far during his abbreviated rookie campaign. In his three previous short track events this season (Salem, Toledo and Winchester) Sargeant has yet to finish outside the top-3. This past weekend Sargeant took advantage of ARCA’s off-weekend and traveled to Maine where he competed and finished third in the Pro All Stars Series Oxford 100. His top-3 finish secured his starting spot in the field for the prestigious Oxford 250 later this summer. Practice for the Iowa ARCA 150 will begin on Saturday, July 9 from 11:30 – 1:00 p.m. Menards Pole Qualifying presented by Ansell following at 3:15 p.m. The Iowa ARCA 150 is live on FS2 at 8 p.m. local Central time. Live Timing and Scoring and live Chat will also be available at arcaracing.com. Be sure to follow Dalton on all social media platforms. You can find him on twitter at @DaltonSargeant and Instagram @DaltonSargeant. He can also be found on Facebook at Facebook.com/DaltonSargeantRacing and at www.DaltonSargeant.com.